Sterile filter for applications in which the compressed air is in direct or indirect contact with the "product". 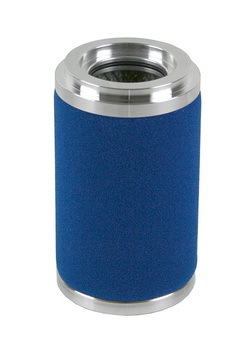 The P-SRF is a wounded depth filter with inner and outer guard end caps made of stainless steel. Consisting of a three-dimensional borosilicate depth media, the P-SRF achieves a void volume of 95%, ensuring a high containment capacity at high flow rates and low differential pressure. A retention rate of >99.99998% related to 0.2 μm is achieved during operation. Valve (1) and valve (4) closes. Valve (3) opens and maintain steam flow into the filter housing. After reaching a temperature of 100 ° C, the steam begins to condense at the same time that there is only opened to the valve (2), the pressure being built up to the desired sterilization temperature. When sterilization rounded cast of valve (2), after which valve (3) & (1) open slowly and valve (4) closes slowly - and then start the process over again. It is often advantageous to have two elements, one is in the filter housing while the other is in the process of sterilization.